I have "special" words. My friend Tamarin has nicknamed these words Brynn-isms. I take these words from my life. ( I just have to giggle because they make complete sense to my screwy brain.) My children are not immune to my words, making up, and gleaning words to make their own. For instance.. TODAY: I decided to make nachos from left over taco Tuesday. We call the middle of the dish the nucleus-chip. Appropriate because the nucleus is the central and most important part of an object, movement, or group, forming the basis for its activity and growth. In nacho-ology we understand that all toppings are present in the center. There is an understanding that we will work on eating from the outside in toward the nucleus. 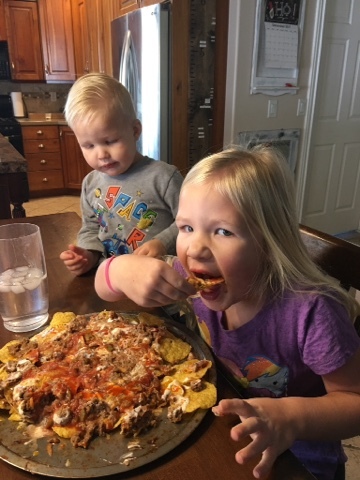 MayLee is a lover of nachos, she digs in.....then smacking her lips says “ this is such a nuclee-chip”. She totally came up with her own word. A nuclee, pronounced New-c-u-lee, is a chip that resides near the outside but still has all the power of the nucleus chip, because it contain most, if not all of the toppings. May’s new word makes my heart happy..
She has fully turned this into a Brynn-ism and will be used from here on out.